Victorio Peak Treasure..Milton “Doc” Noss…Biggest Con of the 20th Century? In 1979 Ova Noss stood on the side of Victorio Peak posing for photos when she told the group, “Like they say, ´there´s gold inthem thar hills´.” Ova Noss died later in 1979 but The Ova Noss Family Partnership is back on White Sands Missile Range seeking access to the legendary treasure. A man named Milton Noss, in 1937, supposedly found a treasure trove of Spanish gold and artifacts in a tunnel within the peak. He then claimed he accidentally sealed the tunnel in 1939 while trying to enlarge it—and another fabulous treasure was lost. But more about the history of this legend in next week´s paper. 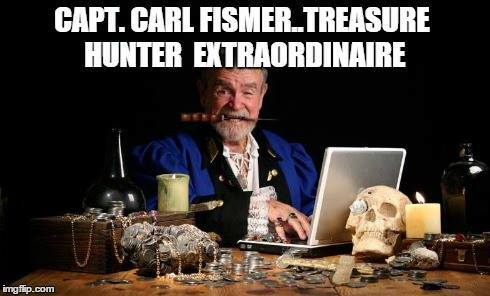 It gets pretty good as it involves skeletons, jewels and gold bars the seekers say are now worth three billion dollars. The Victorio Peak story begins in November 1937 when Milton E. Noss went hunting in the Hembrillo Basin of the San Andres Mountains. By the way, Noss is also called “Doc” because he often passed himself off as a doctor. He was not and was reportedly arrested in Texas for practicing medicine without a license. Apparently there was some sort of choke point in the fissure which made it difficult getting out with the loot. So Noss hired a mining engineer to dynamite that point and enlarge it. Too much explosive was used and the “squeeze” was blasted shut. Efforts to open the shaft or bypass it proved futile. Many people will have you believe that Noss found the original mine, while others say it is just the secret hiding place. Ova did produce a photograph of some gold bars which Doc brought up and one is clearly stamped with the name “La Rue.” Could Victorio be the site of the original mine or the hiding place with the mine located somewhere in the vicinity? I like numbers—let me throw some at you. Expeditions Unlimited had an assay done of the sandstone in Victorio Peak and it came back showing one tenth of an ounce of gold in each ton of rock. To get 100 tons of gold (a number usually cited by supporters based on the number of bars reported) from a site with this concentration of gold would require crushing and processing 32 million tons of rock. In South Dakota, the Homestake Mine is the most profitable and longest lived gold mine in the Western Hemisphere. There the gold assay is two and a half times richer than the sample from Victorio Peak and it has taken them a century to extract 1,000 tons of gold—using modern explosives and equipment, I might add. 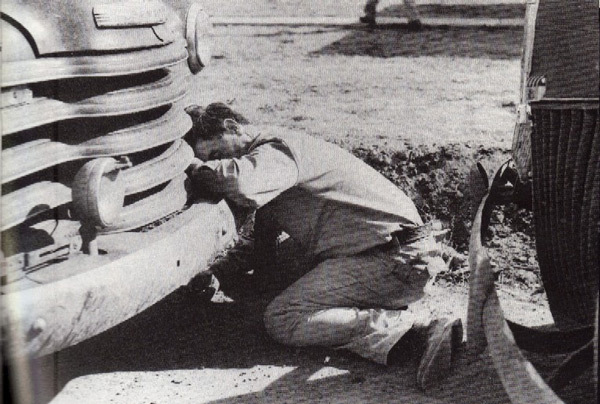 Noss turned up again in 1949 working for Charley Ryan in Alice, Texas. Noss supposedly talked Ryan into traveling with him to New Mexico to check on “the mine.” When they got to Victorio Peak they found Ova controlling the site with a state permit which allowed her to prospect there. 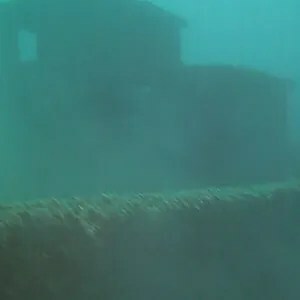 Noss allegedly told Ryan not to worry and they filed claims on sites north of Victorio Peak which contain some lead bearing ore.
Another interesting fact from 1939 involving the Mint is a “gold brick” which was submitted to the U.S. Treasury for assay by Charles Ussher of Santa Monica, Calif. He supposedly paid $200 for the brick which he obtained from a man named Grogan. The assay revealed the bar contained 97 cents of gold. In an investigation conducted by the Secret Service, Grogan revealed he obtained the “gold brick” from Doc Noss in New Mexico. On July 13, 1950 the Army entered a lease agreement with Roy Henderson for the land where Victorio Peak is located. Many people don´t realize there was a goat ranch right at the foot of Victorio Peak. The Henderson family lived there and before that it was grazed periodically by the Gilmore family. In fact, in 1973, Mart Gilmore said he took Noss to Hembrillo Basin in 1936 to show him a cave—at the request of Noss. The next highlight in the story of Victorio Peak is the Fiege episode. Leonard Fiege was an Air Force captain assigned to Holloman AFB in 1958. He later claimed in 1961 that he and three men–Berclett, Prather and Wessel–went hunting in the Hembrillo Basin in 1958 and stumbled upon a tunnel in Victorio Peak. Fiege and Berclett claimed they crawled through it into a small room which contained a stack of gold bars. Berclett recently admitted in a press interview they were hunting gold to begin with, not wildlife. In May 1961 the WSMR commander received a letter from the Holloman commanding general requesting Fiege and partners under a Col. Garman´s supervision be allowed to enter Victorio Peak to “get evidence which they will then provide to U.S. Treasury activities.” On May 29 Fiege and group met with Maj. Gen. Shinkle, the WSMR CG, and Fiege stated it would be a simple matter to recover a few bars of gold. The request was denied. When the Department of Army received the letter from the Mint, officials asked for the WSMR CG´s comments. He said, “My stand has been that I shall deny entry…unless I obtain such permission. I desire this permission…and would like these rumors laid to rest.” On July 30, 1961 Shinkle received permission to allow the investigation. As we go through this scenario, you might want to keep in mind that this is the same operation which television´s “Unsolved Mysteries” claimed only four people knew about. The work began with simultaneous archaeological, seismic and gravity surveys. According to Chester Johnson, a museum rep on site, nothing was found. He added that “a D7 caterpillar was used to cut and build roads where ever they were needed, even on top of the peak.” Most of the scars on the peak are a result of this activity, not any Army work at the site. You might theorize after a mining company had spent two months on Victorio Peak without results, most people would realize gold bars don´t grow out of the ground there. On the contrary, more dreamers rushed into the breach and came forward seeking quick riches from the uncooperative Army. Also, Violet Yancy, Doc Noss´ second wife, showed up asking to get onto the range. Violet popped up again in 1969 making headlines in Texas and New Mexico. She hired two Fort Worth lawyers and was trying to establish her right to the treasure. She indicated there was documentation showing Doc left her 76 percent of the treasure and Ova the other 24 percent. One person conspicuously missing from the recorded requests during the sixties is Ova Noss. More than likely she was operating through various backers at this time. A hot rumor during the Gaddis search was that Harold Beckwith, Ova´s son, was financing the Gaddis operation. Reporters pressed the question at the time but could not confirm it. It may be the family was operating through some other group. In 1968 E. F. Atkins and party started a series of requests and petitions which carried on for years. This was a persistent group which pulled out all the stops in trying to get in. Senator Barry Goldwater wrote requesting permission for the Birdcage Museum of Arizona to explore for treasure. It was determined the museum and Atkins were one in the same. They supposedly also sought entrance through the cooperation of a man named Gill with ABC-TV. Then the range received a letter from the Great Plains Historical Association of Lawton, Oklahoma which stated they had accepted scientific sponsorship of a treasure project at WSMR as outlined by an E.F. Atkins. When all this was denied, Atkins asked for reconsideration and stated several Washington Army Authorities and senators and representatives had recommended approval. On checking with the Department of Army, WSMR learned the Secretary of Army had made no commitment and would back WSMR´s decision 100 percent. This cat and mouse game went on for years. In August 1971, The Department of Army indicated it had already received 55 Congressional inquiries that year on the behalf of Atkins and his request to search for gold. In a 1972 memo for record one range official noted he had received another request from Atkins to explore for gold. He indicated Atkins wanted to get together on a friendly basis and maybe something could be worked out so Atkins did not have to exert Congressional pressure on the Department of Army to gain access to WSMR. He did not get on White Sands. This brings us to the point where Victorio Peak gained national exposure through the Watergate hearings and the likes of Jack Anderson and F. Lee Bailey. On June 2, 1973, Jack Anderson reported in his syndicated column the story of noted attorney F. Lee Bailey´s involvement with gold bars in New Mexico and specifically, White Sands Missile Range. According to Anderson, Bailey was authorized by a consortium to gain legal possession of the golden treasure at WSMR. The group promised to pay taxes and then sell the rest of the gold at a profit to themselves. Bailey was supposedly skeptical at first so he asked for proof. The group came up with a gold bar about four inches long and promised hundreds more to prove their claim. Bailey sent it to the Treasury Department and had it assayed. It proved to be 60 percent gold and 40 percent copper. Anderson´s article quickly pointed out ancient gold ingots often were not pure and this percentage shouldn´t be viewed as significant. A Bailey spokesman later stated the consortium knew the location of 292 gold bars, each weighing about 80 pounds. However, Treasury and Army expressed disinterest in Bailey´s proposals. Just a few numbers at this point. The bar given to Bailey was obviously not one of the alleged 80 pounders. An 80-pound bar with the stated proportion of gold and copper would be about 12 inches long, five inches wide and three inches thick. Interestingly, modern 14-karat gold jewelry is 58 percent gold and 42 percent other metals such as copper. In 1974 the same bar was examined by Los Alamos which came to the same conclusion. The press dutifully reported experts saying the bar was basically the same as jewelers gold. Hmmmm, maybe some old rings melted down? I suppose because he is well connected, Bailey took his problems to U.S. Attorney General John Mitchell. Mitchell then repeated much of it at a lunch with H.R. Haldeman and John Dean. Finally, Dean, during his Senate Watergate Investigation testimony, mentioned something about Bailey, gold bars in New Mexico and making a deal for his client to avoid prosecution for holding gold. As with any story repeated several times, by the time Dean told it there was some distortion—according to Bailey´s people. After a storm of Watergate headlines linking treasure to the investigation, Bailey´s people said there were actually two groups of people. One was a small group which had stumbled onto the gold and the other was a group of businessmen supporting them. Bailey never would reveal who his clients were but it later came out one was a Fred Drolte wanted by authorities on an arms smuggling charge. Bailey later was quoted as saying that given a helicopter and access to White Sands he could have gold bars in 30 minutes. At this point things really started to get interesting. In late 1973 several people stole into the Hembrillo Basin and set off a dynamite charge in a side canyon east of Victorio Peak. They supposedly blasted the Indian pictographs off of a rock wall. Some people claimed if you knew how to read the drawings they would guide you to the treasure. After the trespass, security was beefed up and a house trailer was put in at HEL site just west of Victorio Peak. It was to house range riders and military police. In July 1974 the range announced it was making more improvements to the site with the addition of a helicopter pad, a 30-foot antenna and portable generators. The additional work was done in anticipation of approval for another gold search. At this point Victorio Peak was in the news all the time. There was lots of maneuvering by various groups trying to gain entrance. 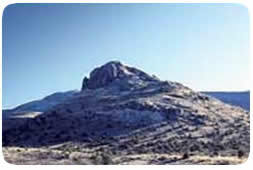 The Bailey group signed a deal with the state(New Mexico would get 25 percent) to allow them first crack at the peak. The Army didn´t buy it and New Mexico battled the Army in the press for quite a while. At the time it must have been very serious for the two sides. But looking back on it and seeing how it was played out in the press, it looks pretty humorous—especially when you consider no one ever came up with anything approaching a whole gold bar and the basis for the whole argument anyway was the story of a man arrested for practicing medicine without a license. As the story grew in the mid 70s a kind of gold fever or hysteria developed with it. The Bailey group starting claiming thousands of bars of gold, not just 292. Maybe it was the oil crisis, but somehow inflation kicked in and the treasure´s worth grew to 225 billion dollars. The Washington Post came to the rescue and rationally pointed out Fort Knox only stored 6.2 billion dollars in gold reserves. As the story spread the missile range started receiving letters from people all over the world asking for information or permission to explore. Perfect strangers came forward to offer their ESP capabilities, their divining rods, their great grandfather´s knowledge and their old maps. Some supposedly legitimate claimants emerged from this. In August 1973 White Sands received a letter from a lawyer named W. Doyle Elliott. It turns out he was retained by Roscoe Parr to get himself a piece of the action. Elliott stated in his letter that Parr, “alone possesses all of the necessary information and instructions from Dr. Noss to,” settle the issue. The letter goes on to say Noss had an insight he might die before gaining access into the peak again and gave Parr all the necessary instructions to access the gold. Also he supposedly told Parr how to divide the treasure and generously offered Parr the balance after it was divided. Elliott solemnly pointed out Parr, “accepted and agreed to fulfill the requests made of him by Dr. Noss.” None of this was apparently in writing. By the end of 1974 you needed a program to keep all the claimants straight. Someone reported Fiege had gone into partnership with Violet Noss Yancy. There also was the mysterious Bailey group, Ova Noss, Parr, the Shriver group, the “Goldfinder” group and Expeditions Unlimited headed by Norm Scott. Ova Noss took the bull by the horns and sued the Army for one billion dollars. The case was dismissed. The Army was reluctant to deal with any one group for fear of showing favoritism. A number of solutions were proposed which included a lottery drawing to determine order of entry and a free-for-all gold rush which probably would have ended in a blood bath. None of these approaches was acceptable. Then Scott was able to organize the various claimants and he proposed Expeditions Unlimited represent the various groups and deal with exploring their claims. The Army accepted and the search was set for mid 1976. This was postponed twice and, finally, “Operation Goldfinder” got underway in March 1977. It was put up or shut up time for most of the claimants. Before it even started the range had to battle the rumors. Just a few days before the start word got around that the search was open to the public. Public Affairs scrambled to get the word out that only authorized searchers and press would be allowed in. A press conference was held on March 18 and the actual search began the next day. Each day, press and searchers were registered at the peak and searched. At one point there was a report one of the claimant groups was going to try to salt the site. They were asked to leave by Scott. The searchers went site to site seeking the elusive gold bars. Eventually, an extension was granted to run the operation until April 1. To say there was some press interest in the event would be an understatement. The New York Times, Washington Post, Los Angeles Times, London Daily Mail, Newsweek, Time Magazine, Rolling Stone and the National Enquirer were all there along with the local and regional print media. Of course, the television and radio stations showed up in force too. Probably the most notable, or, at least, most famous reporter attending was Dan Rather then with “60 Minutes.” He attracted almost as much attention as the peak itself. With the “foreseeable future” now behind us it is going to be interesting watching what happens during the next year at Victorio Peak. Recently, several people have said Doc Noss must be laughing in his grave. Henry James, in his book The Curse of the San Andres, said Victorio Peak was a haunting place with unusual sounds. Maybe he was only hearing a distant chuckle. A rare coin discovered by a widow from Kent while searching a chest of drawers belonging to her late husband has been sold for £240,000 at auction. 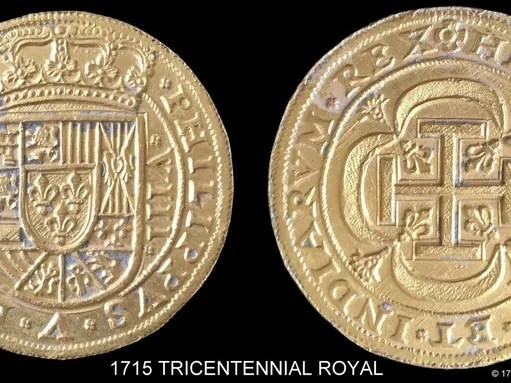 The commemorative coin was made from Spanish gold seized from 18th Century treasure ships and only 16 were believed to have been created. It was sold privately, at double the estimated price, by Gorringes auctioneers in Lewes, East Sussex. The woman, of Tunbridge Wells, said she did not know why her husband had it. 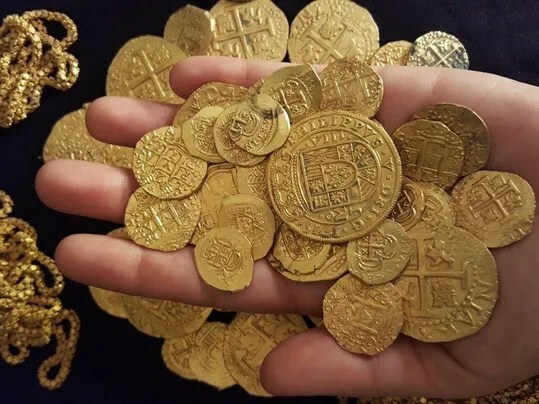 Auctioneer Clifford Lansbury said there had been a lot of interest in the coin from dealers around the world, and it had sold for a record price. “The highest record for that coin being sold in recent years is about £150,000,” he said.